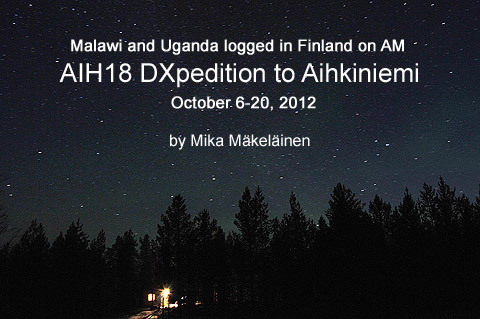 Logging AM stations from Malawi, Uganda and other African countries was the highlight of this October DXpedition. From the East, new Thai and Chinese stations were heard often. AIH18 began just two weeks after we concluded AIH17, and in between there were no major changes in propagation or the smorgasbord of AM stations available. Murphy's Law was proved right as the best conditions of early October took place just one day prior to our DXpedition, and DXing improved markedly on the day of our departure. So, in between, we had plenty of time to inspect antennas, hike in the wilderness and admire the beauty of Lapland's snow-capped fells. My rental wreck was reliable enough, and we didn't get stranded in the middle of nowhere. 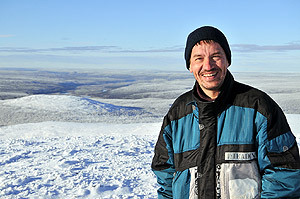 Getting to Aihkiniemi was one of the challenges when preparing for this DXpedition. I had sold my car, so I needed to get a replacement somewhere. Since no one of my friends expressed interest in renting their vehicle, even for a fee, I resorted to commercial renting, which in Finland tends to be excruciatingly expensive. After some investigation I chose a rent-a-wreck type of self-service one-car one-man rental business, where the price was roughly half of the going rate of established agencies. 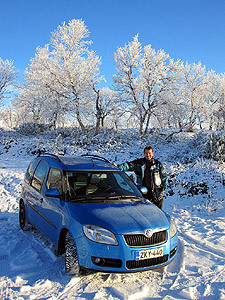 I picked up a Skoda Roomster on Friday morning in Vantaa, and the vehicle turned out to be reasonably OK, even with 200,000 km in the odometer. So in the evening I drove my rental to the train in Helsinki, and took the overnight ride to the Arctic Circle, falling asleep early. It rained all day in Helsinki on Friday, and nearly all day in Lapland on Saturday. Some places in Finland got a downpour equivalent to the average total for October, so traffic advisories on radio were full of warnings for flooded roads. Taking into consideration the circumstances, driving north from Rovaniemi went smoothly. Jim's VIP arrival in Kirkenes, with a chauffeur waiting. Quality programming on YLE Puhe (Talk) offered a flow of intriguing interviews and thought-provoking feature programs. If anything is done well in the Finnish media, it is quality public radio programming. Despite the fact, for the upcoming two weeks I would focus exclusively on foreign radio stations. be as it was when we left two weeks earlier. The scheduled recordings (by Mestor) were technically successful, and now the only chore left is to comb through the many terabytes of recordings. I began AIH18 by myself, as Jim Solatie wanted to stay in Helsinki to take care of his business until the latter part of the first week (which seems to be becoming an annual tradition). Eventually he joined me on Friday, October 12, when I drove to pick him up from Kirkenes in Norway. 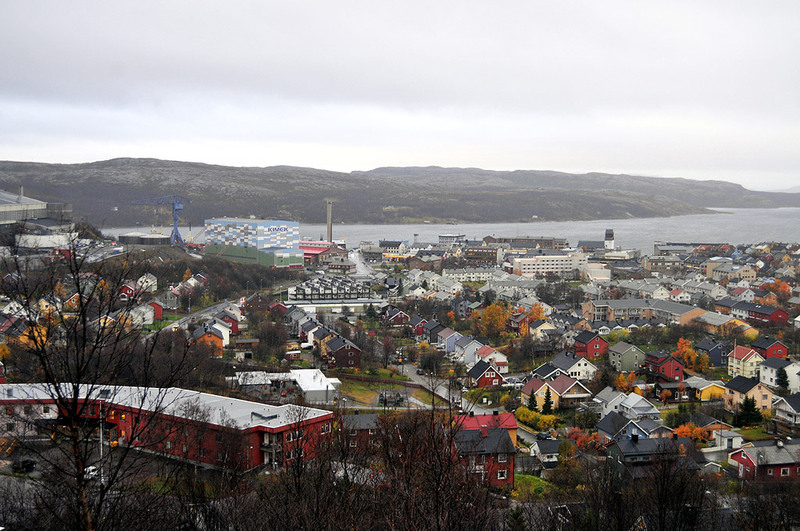 Kirkenes could be a fairly beautiful town if it didn't rain. Jim flew with Norwegian from Helsinki via Oslo to Kirkenes, because it was much cheaper than taking the direct Finnair route from Helsinki to Ivalo. 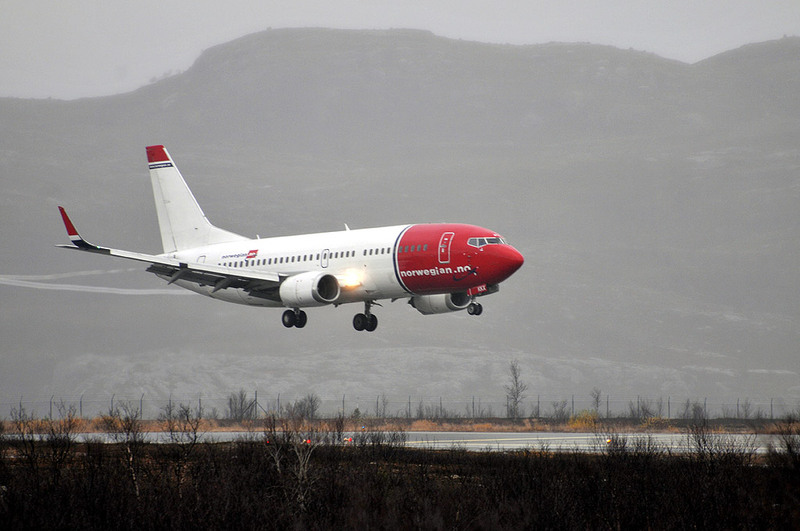 And actually Kirkenes and Ivalo airports are both at the same distance from Aihkiniemi. Once again it rained all day, so there was not much point in sightseeing, but we enjoyed halibut and whale steaks at Surf & Turf Restaurant. 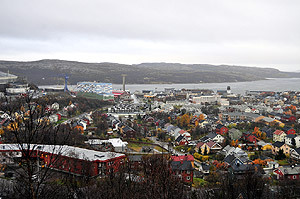 Kirkenes was also a good place to buy some frozen king crab for a gourmet dinner a few days later in the cabin. 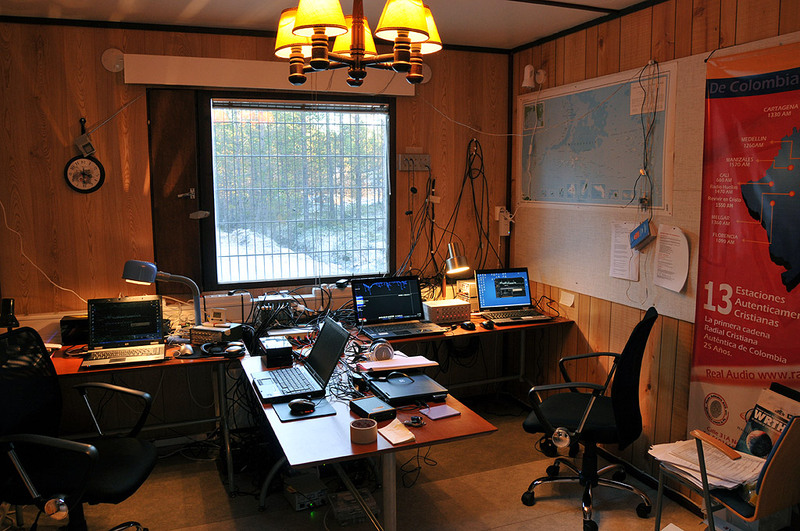 Our equipment in Aihkiniemi consisted of 13 Beverage antennas, each 1 kilometer (3,000 ft) long, which makes our cabin perhaps the best-equipped of all AM DXing bases around the world. We used Perseus hardware, run with both Perseus and Jaguar software. Over the course of the DXpedition we inspected all the antennas and made some improvements, lifting the wires higher with some new supportive poles. 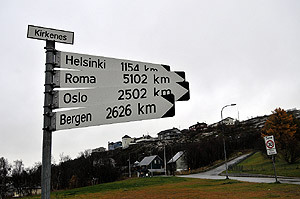 The sign claims that it is 1154 km from Kirkenes to Helsinki, although it actually is about 1350 km by road. The 2502 km to Oslo only applies if you insist on following the rugged Norwegian coastline. 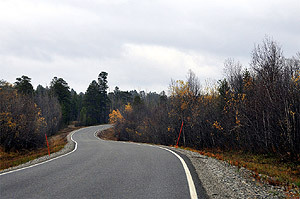 A shortcut via Finland and Sweden would shave 600 km from the total. The amount of technical hardware has grown over the years, now including linear power supplies for all equipment. Sometimes figuring out deficiencies in the setup is quite arduous. One evening I spent a full three hours trying to repair a self-inflicted PC problem. Suddenly my laptop no longer recognized my half-filled external 3TB hard drive. A major logistical problem. I tinkered with Windows settings and repair mechanisms, endlessly, and took the computer accessories to pieces, before I happened to notice the culprit: the voltage in the linear transformer for the hard drive had dipped to 10V  there is an adjustable knob, which I had accidentally touched. After I raised it back to 12V, things were back to normal. Oh boy. Wildlife encounters were close enough, but not too close. We narrowly avoided a reindeer collision on the way back south, and easily avoided a moose collision on the same road a couple of hours earlier. Unlike the moose we saw a month ago, this one really crossed the road in front of us. We also saw three foxes. The weather was mostly miserable, with constant rain, but improved somewhat towards the end. 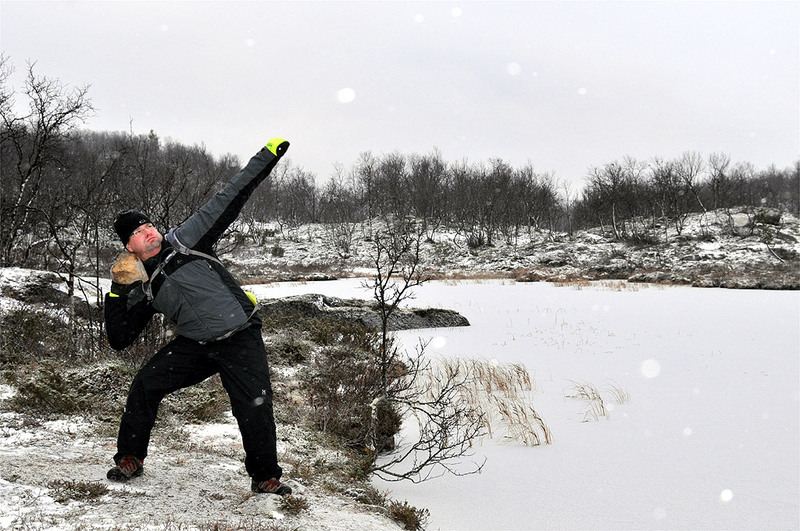 One day we were hiking in the Muotkatunturit wilderness area, when sunshine was finally promised, but we got a snowfall instead. By the end of the expedition temperatures dipped to well below freezing point, our lake froze, and we got a thin layer of snow on the ground. 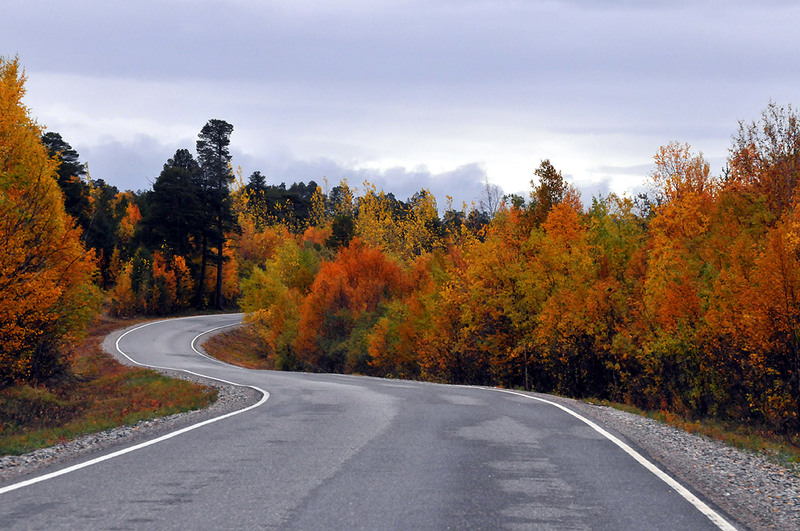 On these latitudes, fall and winter arrive about six weeks ahead of southern Finland. 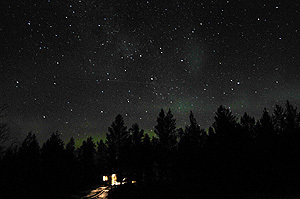 Overcast skies prevented taking photos of the northern lights, but at times of high solar activity the lights were still faintly visible even behind the cloud cover. 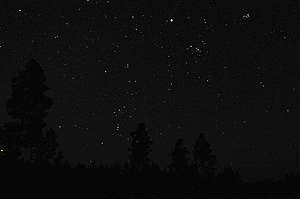 Only one night was completely clear, so at least I got a few shots of the night sky. Looking downhill and south from the slope of Mt Ailigas in Karigasniemi. The last full day Friday was a fabulous sunny day, which prompted us to ditch DXing plans, and to opt for hiking instead. We drove all the way to Karigasniemi (110 km/70 miles west from Aihkiniemi) to climb on the Ailigas mountain, which was a fantastic experience. We parked at timberline where birches were blanketed by gleaming frost. The temperature was -10° Celsius (14° F), the sun was shining, there was hardly any wind even on the top of the mountain, and the first snowfall of the season had coated everything bright white as far as the eye could see, dozens of kilometers to all directions. What a beautiful ending to the expedition. 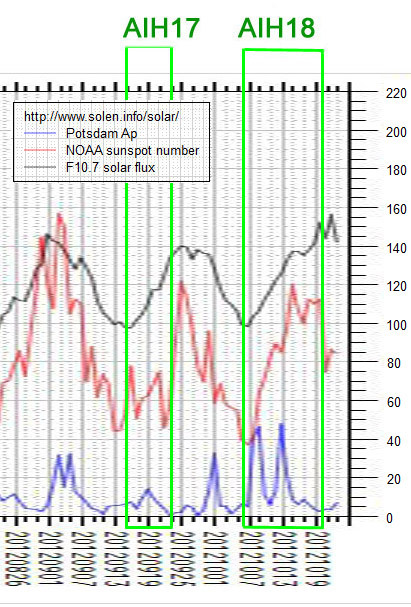 The solar weather was variable, but it seemed like there was almost always some sort of ongoing phenomenon preventing good propagation. We got our share of flares, coronal holes, and polar cap absorption, which seemed to ease just as we were leaving (see tables further down). The last Saturday morning, just as we needed to pack, offered the best conditions to North America. 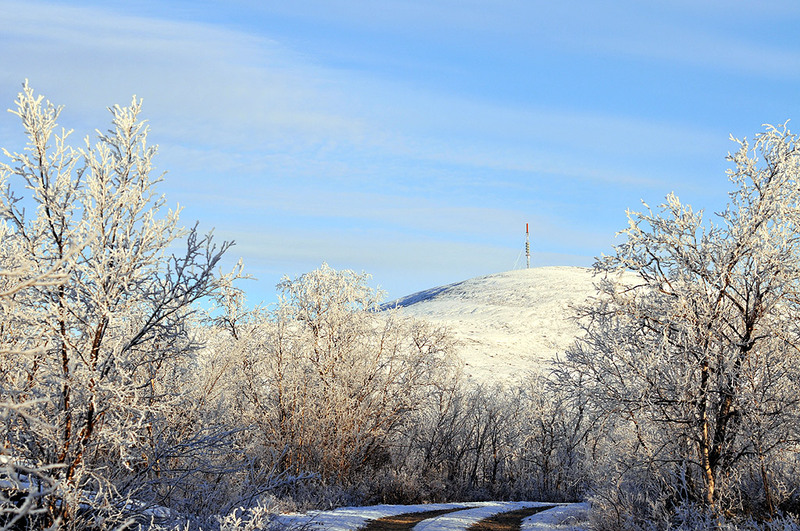 YLE's FM transmitter on top of Mt Ailigas, where we hiked on Friday, October 19. 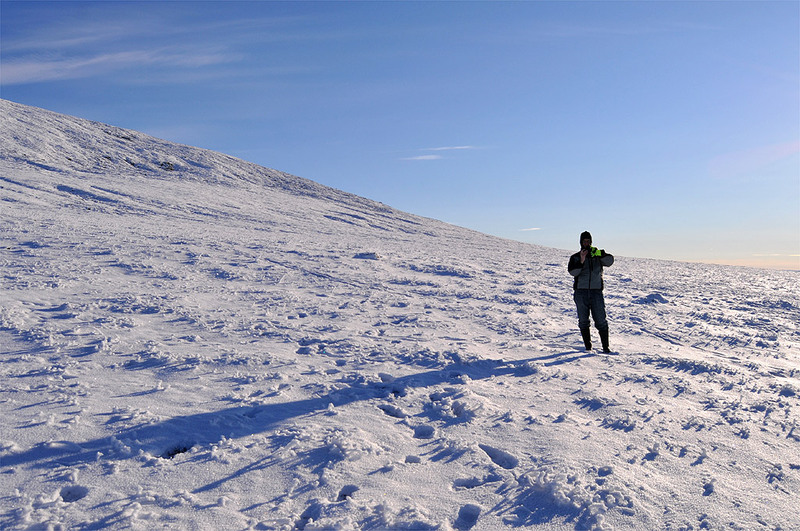 It seemed like the regular summer type conditions switched to winter type conditions in the middle of the DXpedition. During the second week occasional daytime openings were noted more often, and U.S. stations began to replace Brazilians as the main staple of the Western front. The biggest difference was that on the second week we often noted the most common Alaskan and Hawaiian stations, which tend to be completely absent earlier in the season. During poorer conditions our new antennas at 160° and 110° often saved the day. Both Uganda and Malawi were heard on the AM band, which is quite exceptional in Finland. Ethiopian and Mozambican AM stations became almost daily visitors, and 1630 UTC remained the preferred slot to identify regional Iranian stations. 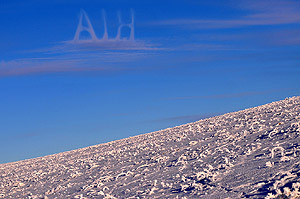 Traditionally on Lapland DXpeditions African stations have been hunted using only the back lobe of an antenna pointing at Alaska. However, judging by how poorly our 160° Africa wire performed as a back lobe for Alaska, compared to the real Alaska antenna (10°), it does make a big difference to have a Beverage antenna pointing straight at your target area. The other new wire at 110° was very useful as well, especially in hunting for Indian stations at sign-off (most often at 1740 UTC) and sign-on (around 0023 UTC). This and 80° were the best wires for Thai stations, depending on the direction of interfering stations on the same frequency. 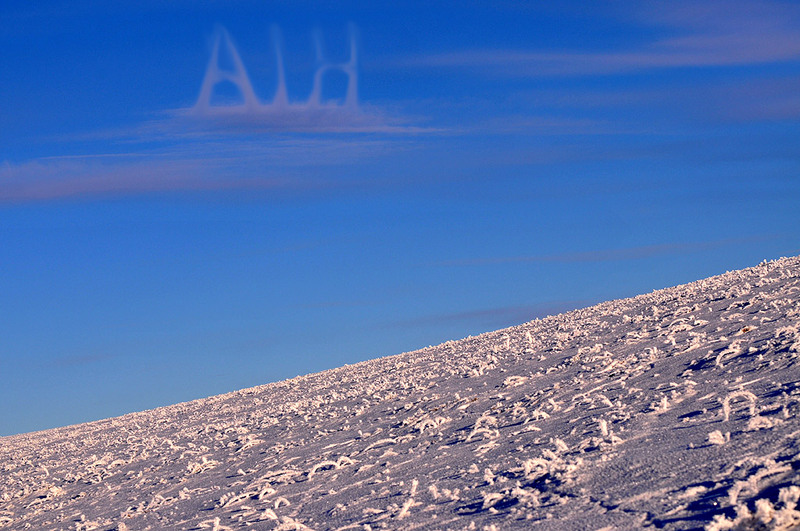 In Aihkiniemi the DXpedition season began already in September, but other Nordic DXpedition sites joined the action during AIH18. 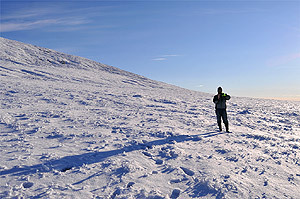 You can follow events in Kongsfjord (KONG22), Norway, in Bjarne Mjelde's and OJ Sagdahl's blogs. 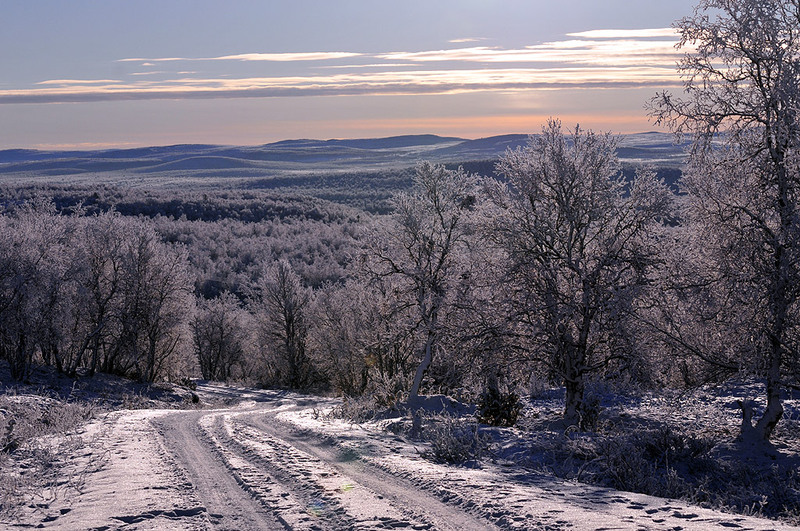 Comprehensive logs from Parkalompolo (PAX98), Sweden, can be found in an updated RTF file, and an overview of the conditions from the perspective of Lemmenjoki (LEM318), Finland, is available here. Conditions to Asia opened around 1315 UTC, with mostly South Asia and later the Middle East. After 1400 UTC nearly all stations vanished, but Iranians were going pretty well by 1530 UTC, which is a good potential ID time. Nothing remarkable was caught live. Quite a few Thai stations were heard before their closing time at 1700 UTC, so I hope that something new will be found in the recordings. As the temperature was close to -10° Celsius (14° F), DXers accustomed to the Arctic just can't take the heat anymore. Saturday's t-shirt: KABL 960, one of my favorite stations when it was still "America's Best Music" when I lived in the Bay Area almost a decade ago. Just a few Indian stations were heard at sign-off after midnight UTC. Brazilian and Argentinean stations emerged gradually so that by midnight UTC I started recording them. Reception was best after 0400 UTC, and they vanished by 0500 UTC. My best catches include ZYH920 Rádio Mirante, São Luís MA on 600 kHz and ZYH422 Rádio Difusora de Macapá, Macapá AP, on 630 kHz  this one of course well known because of its shortwave transmissions. There was absolutely no sign of any North American stations during the night or morning. It rained all day, and I slept through most of it. In the afternoon the first signals from Asia arrived around 1230 UTC. At 1300 UTC it seemed to make sense to record using 60 and 80 degree wires. However, already by 1330 UTC, the 110-degree wire began picking up more, so the window of reception from East Asia was rather short. I was very pleased to catch DXCC from Cagayan de Oro on 828 kHz, but otherwise there was no Philippine invasion. By 1530 UTC it was all Iranians and the Middle East, but very soon Europeans took over most AM frequencies. In the evening I drove to Jounila Lodge for a shower. Sunday's t-shirt: the rare non-radio shirt, Death Valley, as the conditions were dry and lifeless. First the good news: the rain has ended. The bad news: the conditions are really poor. Overnight nothing interesting from any direction. Perhaps the 160-degree-wire will eventually yield some Iranians, Europeans or Middle East stations worth reporting. Just a handful of Brazilian stations were heard around "sunrise" (haven't seen the sun so far though), fading out after 0500 UTC. Spanish stations were extremely strong right after 0500 UTC, but unfortunately had lost steam by the time of COPE and RNE local breaks at 0525 UTC. I still got RNE5 Cáceres with Extremadura regional programming on 1107 kHz, a new one for me. 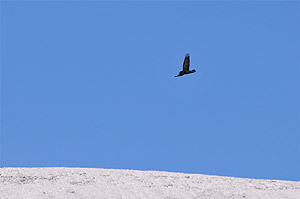 A raven (Corvus corax) circling Mt Ailigas. I even resorted to hunting for Latin American shortwave stations, but all through the night the tropical bands were dead quiet, just some weak Asian stations audible. Daytime was empty on the dial, and signals from the East faded in only around 1500 UTC, which is extremely late for this time of the year. Only the 160-degree wire was usable, as hardly any stations east of Iran were audible. I focused on reviewing automated recordings from the previous week, and found for instance Radio Programas del Peru (920 kHz) and WPLN Madison TN (1430 kHz). Friday, Oct. 5th seems to have been the best day for U.S. stations (during the past couple of weeks). Also, Asian stations arrived remarkably early, even at the 1100 UTC slot. Too bad that our recordings covered only short segments. Vision Radio Network from Australia on 1611 kHz was a new finding for me. 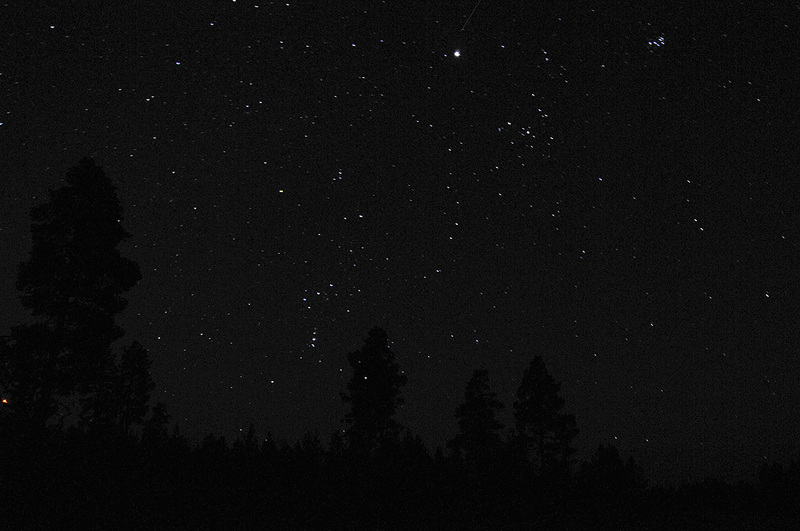 In the evening things began to improve  no thanks to conditions, but thanks to having an antenna pointing south. 2100 UTC is often a good time to get stations from East Africa, and conditions being very auroral, prospects for getting some new ones should be decent. I reviewed my recordings during the day, and the haul was impressive: Radio Ethiopia was detected signing off on several frequencies, 828 kHz offering the best reception. Egypt was identified on several not very common frequencies (1278, 1476 and 1584 kHz), and Malawi BC luckily improved just at the top of the hour on 1422 kHz. Then there were a bunch of more regular stations (VOA Botswana 909 kHz, KBC 1233 kHz, R Free Africa 1377 kHz), and tentatively even Radio Veritas on 576 kHz. Interestingly, I heard several Iranian regional stations identifying at this time, such as Radio Fars on 594 kHz and Radio Ahwaz on 711 kHz (ID in Arabic, then proceeding with Farsi programming). All of this with the 160-degree wire  while all other antennas were useless in the evening. Today's t-shirt: KGO 810 Bay to Breakers 2004 team's shirt. I visited KGO a few days before the run, and felt really bad about not being able to join the funny race. Someday I'll be back in the Bay Area at the time of the event. Overnight was poor to all directions. In retrospect I found some Brazilian and Argentinean stations audible at 2240-0020 UTC, but after that the AM band pretty much died. Even the few Europeans all but vanished before daybreak. Plenty of time to listen to the recordings during the day. Just as Monday, signals from the East began creeping in very late. The first Asian stations were detected at 1415 UTC, but when I began recording just before 1500 UTC, the only usable antenna was the one pointing south. A slight improvement from the day before, as there were even a few Japanese powerhouses in the Asian mix heard on the 60 degree wire, but nothing worth a closer inspection. Auroral conditions continued on Tuesday evening, for instance Radio Ethiopia on 855 kHz was strong, and Radio Veritas on 576 kHz audible. 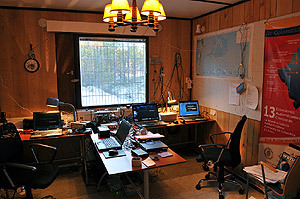 During the night stations from Brazil visited briefly around 2100 UTC, and resumed later with stations from Argentina around 2340 UTC. Overnight offered a couple of nice catches from Southeast. I was happy to hear AIR Naushera on 1089 kHz (with Radio Kashmir programming) and Radiokanal Kavkaz from Groznyy on 657 kHz. I had been actively hunting for Groznyy since the early 1990's, and by now I had already forgotten about it  until now stumbling on it accidentally. It seems that the post-war transmitter is much more powerful than the previous one and has become a fairly easy catch. At daybreak, Brazilians faded out, but a few Peruvians came strong, especially Radio Turbomix from Cajamarca was booming on 1540.5 kHz. The best station caught live was ZYH479 Rádio Cultura, Guanambi BA on 1530 kHz. 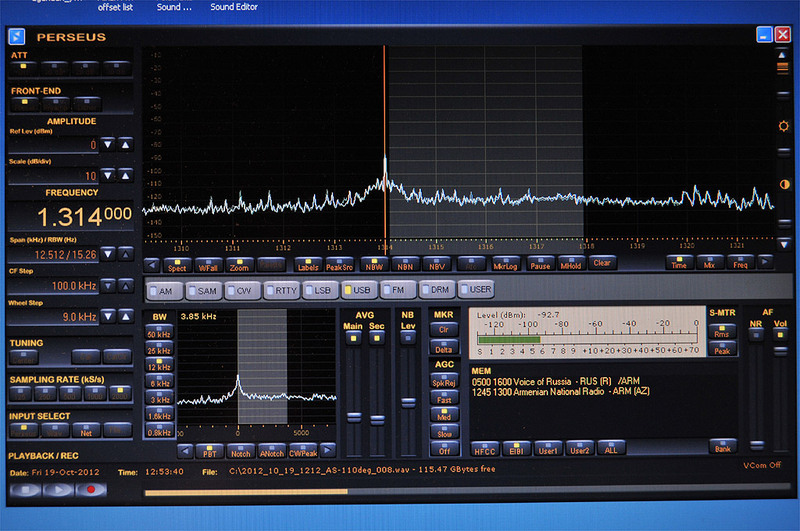 The first U.S. stations in several days emerged at 0315 UTC, and continued on and off surprisingly until midday local time, but the signals were so weak that nothing interesting was to be expected. 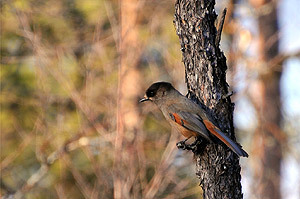 In the afternoon the first Asians appeared briefly at 1245 UTC for about 15 minutes, and then resumed around 1330 UTC. Wednesday evening turned out to be excellent for Asia, because for once the dial was not a mishmash of everything from the Eastern hemisphere, but instead a much narrower selection was available. Japan, Korea and northern China were all out, and Iran on the other end was not too strong, so South East Asia dominated the dial. A closer look at the files will surely reveal some Thai stations which I've never identified before. Later in the evening I noticed an RNE break which I usually haven't paid much attention to. It has been known for a couple of years that a few regions opt out of the national programming at 1745-1800 UTC, but either my interest at that time has been in listening to Indian and Pakistani stations closing down, or taking a break from DXing, or then the conditions have just not been favorable for Iberia. Now I noticed that Catalonia indeed began a regional break at that time, while La Rioja followed exactly two minutes later, at 1747 UTC. I was hunting for a few outlets in Murcia and Navarra, but unsuccessfully this time. 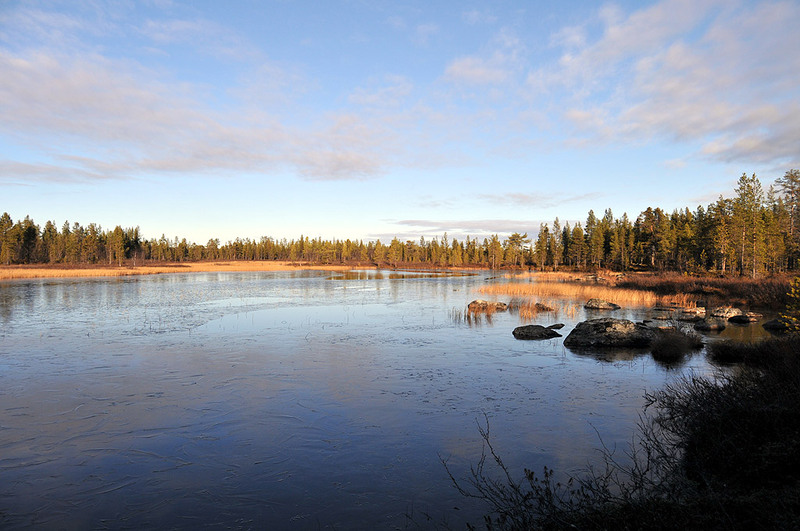 More miracle territory: Soon you can walk on water here. One excellent catch was found from reviewing recordings of the past couple of weeks: Star FM from Uganda on 576 kHz. Probably unheard in Europe before this. And today's t-shirt: 1010 WINS New York. Back in the 1990's they were known to be fairly reluctant to verify reports, so naturally I had to pay them a visit  which was rewarded with a QSL and a t-shirt. Overnight some Brazilians were heard during two short openings, at 2300-2340 UTC and at 0100-0130 UTC, but signal levels were poor. When hunting for Indian stations I noticed that Xinjiang PBS seems to have launched a new transmitter on 1026 kHz, with Chinese language programming, and audible even past 0100 UTC. UFO landing site? Meteorite? Russian missile testing? Thursday morning turned out be OK, there was a decent opening to Brazil and Argentina at 0400-0500 UTC. My best instant loggings were Radio Libre, San Justo, on 890 kHz, and Radio Provincia de Corrientes on 900 kHz. Around daybreak the AM signals just vaporized, but surprisingly, in the middle of the day, U.S. West Coast and Alaskan (first time on AIH18) stations appeared on the dial for an hour or two. Nothing much of interest, low signal levels, but nevertheless very encouraging. In the afternoon Asian stations made two brief visits, first at 1200 and then at 1300 UTC, only to vanish again very soon, but finally from 1415 UTC Asian signals were here to stay, and signal levels were mighty, stronger than on any previous day. Initially around 1500 UTC focus was still in northern China, with some Japanese in the mix, but gradually conditions shifted to lower latitudes. I heard a bunch of the most common Philippine stations, but the opening didn't extend all the way to Indonesia or Australia. The evening was quite different from the previous one; around 1745 UTC not a single Spanish station was heard, and they were quite weak also later in the evening. The 160-degree wire brought again some Africans, such as EP Cabo Delgado on 1224 kHz with a nice local station ID before closing at 2200 UTC. At the same time, Brazilians gradually emerged on the Western front. Today's t-shirt is Radio 538 from the Netherlands. The odd station name derives from the old wavelength of Radio Veronica. Nope  yours truly playing again. 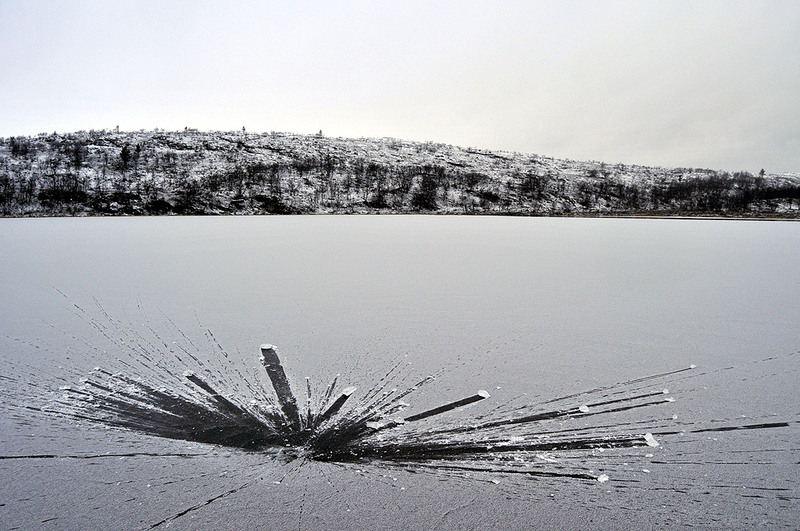 Breaking the ice at Veajetláttu, an alpine lake in the Muotkatunturit wilderness area. Very poor conditions on Friday morning, nothing from anywhere  just some Brazilian and Argentinean stations before and after midnight. I left some automated recordings in the daytime when I went to pick up Jim from Norway. In the evening we had good conditions to Asia. It all began with Japan around 1315 UTC, taking a step back then, and proceeding to China, and eventually to the Philippines and Thailand. Our highlights include the Thai station in Udon Thani on 747 kHz and DZRJ on 810 kHz. Overnight was very poor, and we didn't hear anything worth mentioning. Also the morning seemed a total loss, without any daybreak enhancement, until around 0520 UTC when I noticed that the Alaskan stations are really booming. Mjelde alerted us to TIS station WQLE259 Prudhoe Bay AK on 1610 kHz, which was nice to hear again  heard here in Aihkiniemi two years ago for the first time. Also some Midwestern/Prairie stations were heard, best around 0700-0800 UTC. After this alpine training session, Jim is ready to compete in shot put in the next Olympics. Since Saturday morning conditions have been extremely volatile, characterized by short and sharp openings to random directions on an otherwise quiet and empty AM band. This kind of a situation requires constant monitoring, and surely we have also missed a few openings. This pattern of on-and-off conditions was exemplified on Saturday afternoon, when there was first a brief opening to Japan around 1140 UTC, lasting less than half an hour, after which the band fell quiet. 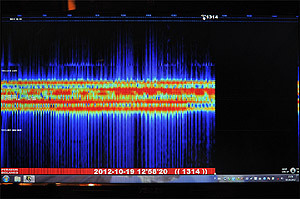 Around 1300 UTC Thai stations appeared briefly, before disappearing soon. Then from 1345 UTC onwards we enjoyed very good conditions to Asia, first to China, peaking at 1430 UTC, and then around 1500-1600 UTC to Thailand, which was perhaps the best ever opening to Thailand that we have experienced. Also the relatively nearby station of RRI Banda Aceh from Indonesia was heard on 1251 kHz. Thanks to our 160-degree antenna, Africans were also prominent. Later in the evening Malawi (1422 kHz) and Mozambique were once again heard on the AM band, and Radio Mayotte Première gave a local station ID on 1458 kHz at 0200 UTC. Overnight there was an opening to Brazil roughly at 2315-0000 UTC, and an opening to the Midwest and Canadian Prairie around 0000-0200 UTC. Not all of these openings probably result in any significant findings, but the constantly changing nature of the AM band surely keeps us awake and alert. Outside, the northern lights were detected even behind the cloud cover, so we can only imagine how impressive they would have been without the overcast skies. One the menu: fresh halibut bought from Kirkenes a day earlier. Today's t-shirt is a bright yellow shirt from Country 98.7, which  if I remember correctly  could be from an FM affiliate of 1620 WNRP in Pensacola FL. Four years ago I was covering Senator John McCain's presidential campaign there, and stayed overnight in a motel which happened to be right next to WNRP. I couldn't resist a visit, which resulted in a on-air interview. Incidentally, WNRP is still the only regular X-band station from the U.S. which I haven't heard here in Finland. Sunday morning was a total waste, nothing from any direction. 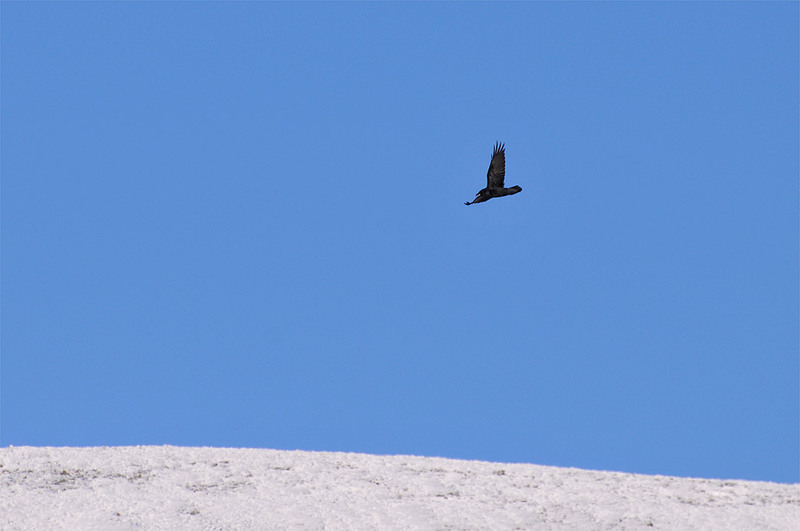 Just a few common Alaskans were heard during daytime. In the afternoon, Asian stations first appeared before 1300 UTC, along with improved Alaska and Hawaii. 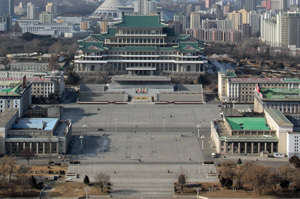 The first Asian appearance was however short, and the second wave came an hour later. It took another hour before conditions became a bit more interesting, with a focus in South Asia, especially Thailand. Several interesting Thai frequencies were noticed (such as 1134 and 1143 kHz), and conditions extended to Australia, from where Rete Italia was logged on 1611 kHz. The ABC station 6PNN Busselton WA on 1152 kHz has been an almost daily guest in our shack, but today it was even stronger than normally, although no other WA stations were heard. Today's t-shirt: "Recuerdo 870", which is KLSQ Whitney NV, heard and received ages ago when t-shirts and snail mail were more common than attachments and email. Jaguar  Mika's choice of DX software. Notice how Jaguar reveals that there are actually five stations currently more or less audible on the frequency of 1314 kHz. If you know their exact offsets, you already know with some likelyhood what station you could be listening to. Overnight was once again uneventful, with just a few weak trans-Atlantic signals from Brazil and North America. 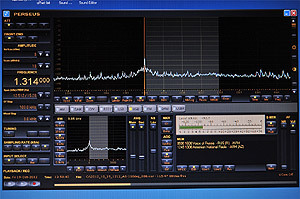 Some stations from Canada and the Great Lakes region were heard around 0200 UTC, and gradually North American stations became stronger. Around 0400 UTC even some graveyard frequencies were open  in addition to the dominating CBC stations. The morning opening to North America evaporated fast, but we still got a couple of nice catches, the highlights being KLTZ Glasgow MT (1240 kHz) and KNSP Staples MN (1430 kHz). During the day, stations from Alaska and the Pacific Northwest were much weaker than on the previous day. In the afternoon the first Japanese stations were found after 1200 UTC, and the Eastern focus remained on these high latitudes until 1700 UTC, when some Koreans were still heard giving local station identifications. 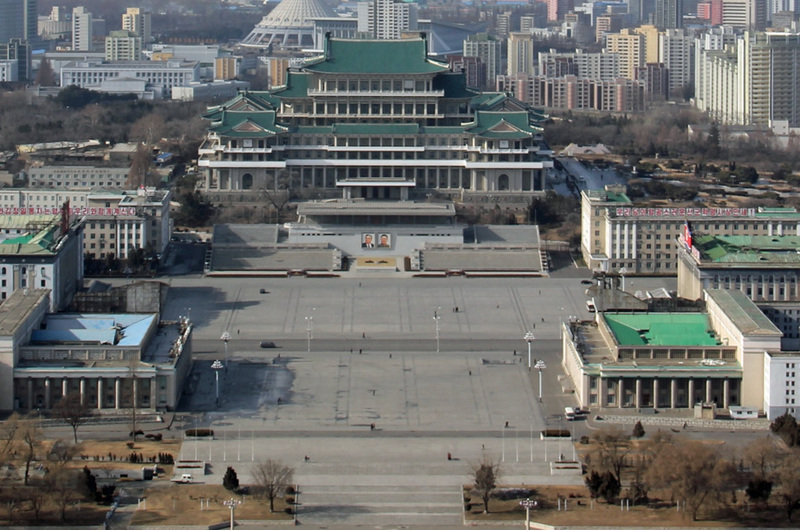 Also, AFN from Korea was heard weak both on 1080 and 1440 kHz. The tidal waves from Japan landed at unfortunate times, and during NHK local breaks the reception was always fairly poor, so we didn't manage to find anything new. As an example of the stations heard, JOLC NHK2 Tottori on 1125 kHz, a familiar station to both of us, was quite strong at closing time, 1540 UTC. 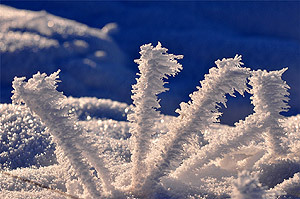 All in all, mediocre conditions, and it seemed to be easier to find something interesting when conditions moved south. For instance, Radio Bangladesh, Khulna, was heard on 558 kHz around 1530 UTC. Even those who may shun the more exotic Asian languages should take note that at this time both Bangladesh (its powerful flagship station being on 693 kHz) and Myanmar/Burma (best heard today on 576 and 594 kHz) are broadcasting English-language news. Starry starry night... and yes, this is indeed our cabin, where we search for far-away intra-terrestrial signs of life. The faint line in the middle is probably a satellite. On the menu we had both Brazilian tenderloin steak and Barents Sea king crab. Yummy! It doesn't look like we're going to lose any weight on this DXpedition. Today's t-shirt: WTVB Coldwater MI 1590 AM, which used to be, and still is, "The Voice of Branch County". Back in 2004 I happened to be driving across the continent with my family, and on our leg from Chicago to Cincinnati we took a short excursion to Michigan, where getting a QSL from WTVB was on the agenda. The detour was rewarded with a station t-shirt, sponsored by McDonald's. There was nothing much to listen to overnight, just a couple of weak Brazilian stations. Who knows what station on 1540 kHz relays Rádio Evangelizar (1060 AM)? Siberian jay (Perisoreus infaustus) is an extremely curious bird. Patient birders have been able to hand-feed these birds, which come to take a close look at what we're doing in the forest. In the morning North American stations became audible at 0300 UTC and improved quickly so that at 0440-0510 UTC we enjoyed a good but short opening to the U.S. and Canada, focused in the Canadian Prairie and the Rocky Mountains. No rarities were encountered, but for instance KCAP Helena MT (1340 kHz) was identified. During the day a few weak Alaskan and Pacific Northwest stations remained on the dial, until at 1200 UTC Alaskan stations improved, with a few Hawaiians in the mix. 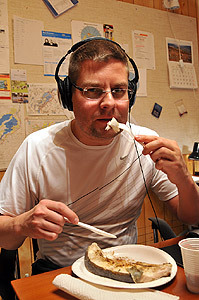 At 1245 UTC Japanese stations appeared out of the background noise (over half an hour later than at Kongsfjord), but nothing interesting was found, and no Pacific stations were heard. The first wave was short-lived, and by 1315 UTC the AM band was mostly quiet again. Recordings resumed at 1400 UTC when conditions favored China for over an hour. At 1515 UTC signal levels dropped once more, and later on Europeans began to take over the AM frequencies. Our best Asian catches include Fujian PBS (558 kHz), Phon Por Thor Or, Bangkok (594 kHz) and Yunnan PBS (927 kHz). The fall colors are gone. Compare this to a shot taken in the same place three weeks earlier during AIH17. Today's t-shirt: WIFE (100.3 FM /1580 AM) Connersville IN, which I heard back in 1995 and which still remains one of my best ever catches. Chief Engineer Mike Peacock investigated my report thoroughly and confirmed that at the time of listening the station was broadcasting at only 4.6 watts of power! I visited the station in 2004 when driving on the previously mentioned trip, just a day after the Michigan detour. You can read more about my lovely WIFE in this article. 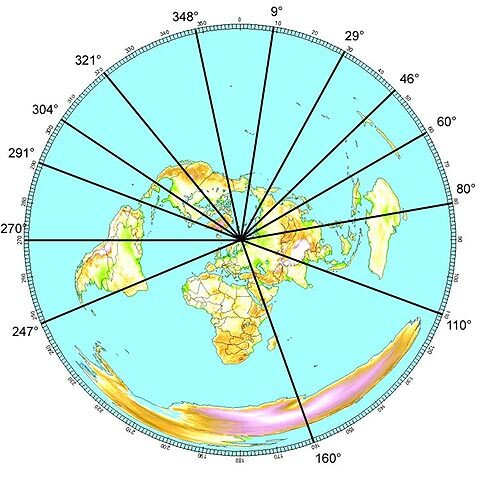 During the night North American stations were heard for a couple of hours, especially around 0200 UTC, which is pretty good by the standards of an approaching solar maximum. However, at least so far there was nothing new for us. By 0300 UTC almost all trans-Atlantic signals had disappeared. In the morning North American stations were heard fairly well just before 0500 UTC, but by 0515 UTC almost everything was gone. Perhaps the best station identified during this short opening was KWBE Beatrice NE on 1450 kHz. During the day expectations were high in terms of stations from Oceania, but  once again  nothing was heard. At 1300 UTC a few Alaskan and Hawaiian stations became audible. A scene which you could spend hours looking at  if it wasn't so cold. The Asian front remained quiet all the way until 1400 UTC, and the selection of stations was smaller than just about any other previous day. Initially, some Japanese and Chinese powerhouses came through, but in an hour, Iranians were almost all that remained, and European stations were taking over the frequencies. This was the weakest Asian opening of the entire DXpedition so far. On a positive note, one of the local pests, Murmansk, was off the air  probably for maintenance  on 657 and 1134 kHz all day, but conditions being feeble, there were no interesting stations to be heard on those frequencies. Overnight was once again very poor. Actually we slept through the night until 0340 UTC, and I'm glad we did, because based on a quick review of our programmed night-time recordings, we didn't miss anything from any direction. At daybreak we were expecting at least a brief enhancement of North American stations, but the opening turned out to be much weaker than during the previous couple of days. The best top-of-the-hour was once again 0500 UTC, when common Colorado stations seemed to be on top of many regional channels. As the AM band didn't sound very promising, we decided to go hiking, getting the first snowfall of the season (when sunshine was forecast). 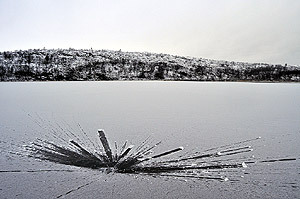 Already on Wednesday temperatures had fallen well below freezing point, and now our small lake is almost solid frozen. 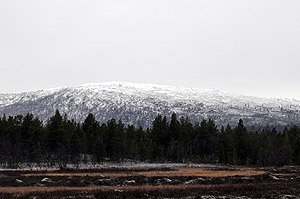 On Thursday evening we got a thin blanket of snow on the ground also at the cabin. We left hiking at 0600 UTC and returned after 1100 UTC. We did leave some Mestor recordings, and it seems that at least a bunch of North American stations were audible around 0800 UTC, but not much is expected from these recordings. Also some Alaskans and Hawaiians were noticed in the afternoon. Just after our return, the first Chinese stations were heard right before 1200 UTC, and the following couple of hours were very good in terms of China and Vietnam. Shaanxi PBS on 603 kHz was one of our highlights of this afternoon session. T-shirt of the day: Hawaii Public Radio. Back in 2008 I was doing a background report on President Obama's childhood in Hawaii, visited the local public radio in Honolulu and bought a t-shirt as a souvenir to myself. In the good old days they used to operate on 1380 kHz, moving on to 1370 kHz later, but now looking at lists it appears that KUPA Pearl City on 1370 AM is a sports station, and public broadcasting can only be found on FM. Once again overnight recordings were a total waste of disc space, and deserved to be erased at dawn. In the morning we heard a few trans-Atlantic stations ranging from Brazil to Colombia and all the way to Canada, but the signals were few, weak and short-lived. So, as Friday turned out to be a fabulous day weather-wise, we headed hiking. 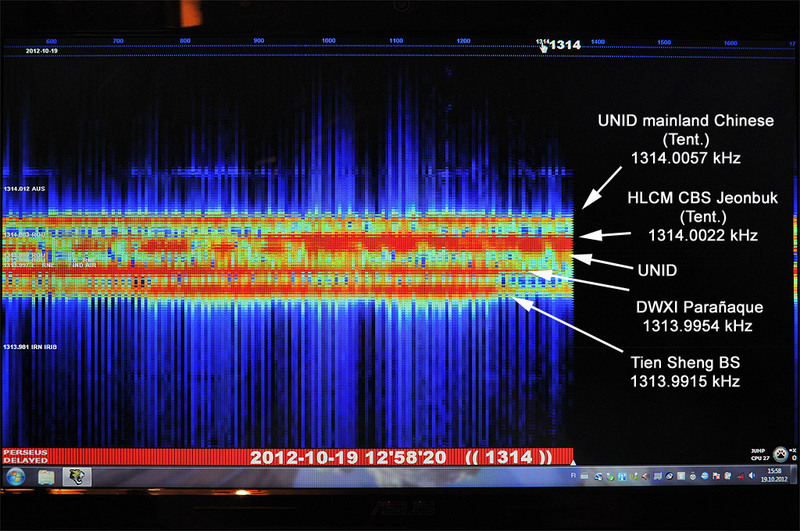 When we returned to the cabin around 1120 UTC, some Chinese signals were emerging, and at 1200 UTC quite a few Chinese stations were heard. On Thursday the China opening had begun from Ningxia province, but today most of the first stations were from Jiangsu. Very soon he conditions were however very general in nature, ranging from Japan to Thailand, and nothing new was found. To name a few, Nei Menggu PBS (1197 kHz), Xuzhou PBS (1269 kHz) and Pujiang zhi Sheng (1422 kHz) were among the identified Chinese stations, and HLAT MBC Yeosu (1080 kHz) was heard from Korea. 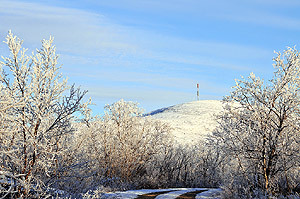 Two local pests in Murmansk (657 and 1134 kHz) finally returned on the air at 1217 UTC after an extended maintenance break. Today's t-shirt: KBOV Bishop, California, 1230 AM. In 2004 I drove to Death Valley, and paid a visit to KBOV which I saw along the way. Back in the 1990's I had heard quite a few Californian graveyard stations, and figured that it should be possible to catch also KBOV in Finland, but it hasn't happened so far. KBOV's location in the deep Owens Valley may be one reason. The retro style t-shirt of this oldies station is one of my favorites, and reminds me of this remaining DX challenge. We slept through the night to be in good driving condition. Mestor seems to have caught some North American stations, which improved in the morning. For the first time American stations were heard fairly well through the morning hours until we pulled the plug at midday. We took notes of very few live loggings as we focused on packing. Mexican XETUL Tultitlán ME on 1080 kHz was one of the highlights. The next crew, Martti Karimies and Jari Sinisalo, arrived already past 10 a.m. after driving all night. It was really nice to see them, and this was in fact the first handover in the history of Aihkiniemi DXpeditions when two successive crews actually met in the cabin. Martti and Jari at least got a good start for their DXpedition. 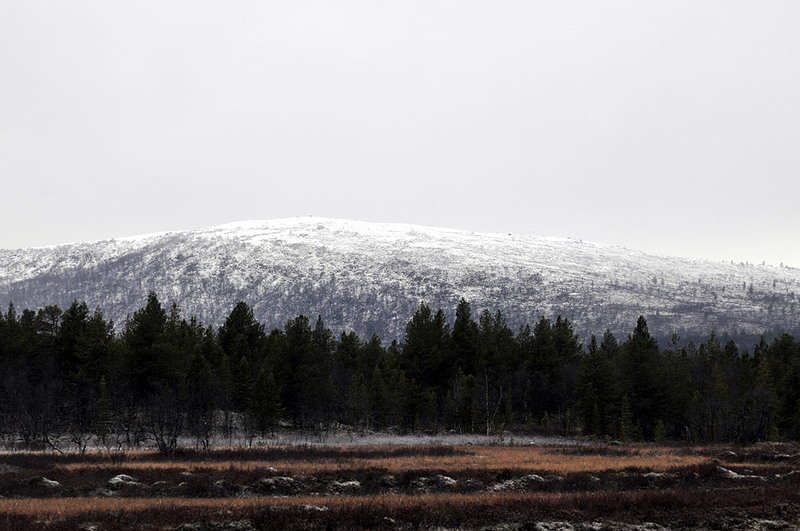 Around 12:30 p.m. we began driving south, dodging moose and reindeer on the way. In Inari we stopped at Siida, the National Museum of the Finnish Sámi. For about 100 kilometers around Saariselkä the roads were icy and slippery, but otherwise it was a pleasure to drive to Rovaniemi, where we enjoyed a Chinese dinner and from where we took the overnight train south. For more information about Aihkiniemi, check out this article.